Mmmm! 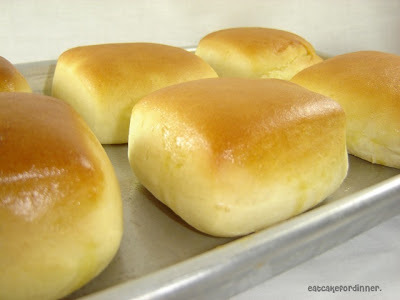 I love rolls! Fresh from the oven, soft, with butter melting on them . . . what could be more enjoyable? As a child, one of my favorite parts of special family dinners was knowing I was going to be able to enjoy a couple of my grandma's rolls! So, as I browsed on Pinterest, I noticed a recipe for rolls. The picture alone was enough to put a smile on my face! With Resurrection Sunday just around the corner, I thought I'd share the recipe with you today! Just follow the link for the recipe . . . I will be cutting the recipe in half because as much as I love rolls, I really do not need five dozen of the wonderful, tempting things in my home! :^) I think I'll make a little garlic butter to go with them and these rolls will be the perfect addition to Resurrection Sunday dinner!